Review by AllTheBestFights.com: 2019-03-23, we are going to comment and rate the fight Lawrence Okolie vs Wadi Camacho as soon as possible. The undefeated former Olympian Lawrence Okolie entered this fight with a perfect boxing record of 11-0-0 (8 knockouts) and he is ranked as the No.23 cruiserweight in the world. In his last three fights he has won over Luke Watkins (Luke Watkins vs Lawrence Okolie), Matty Askin (Matty Askin vs Lawrence Okolie) and Tama Lodi (Lawrence Okolie vs Tamas Lodi). His opponent, Wadi Camacho, has an official record of 21-7-0 (12 knockouts) and he entered as the No.42 in the same weight class. He lost to Arfan Iqbal in 2017 but then he has won four bouts taking revenge on Iqbal in his last one. 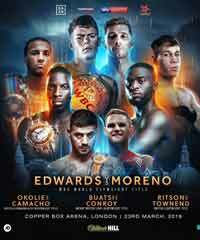 Okolie vs Camacho is on the undercard of Charlie Edwards vs Angel Moreno. Watch the video and rate this fight! Review by AllTheBestFights.com: 2019-03-23, we are going to comment and rate the fight Charlie Edwards vs Angel Moreno as soon as possible. The Wbc Flw champion Charlie Edwards entered this fight with a pro record of 14-1-0 (6 knockouts) and he is ranked as the No.2 flyweight in the world (currently the #1 in this division is Kosei Tanaka). He suffered his only loss when he faced John Riel Casimero in 2016 (John Riel Casimero vs Charlie Edwards), since then he has won six bouts defeating Ricky Little, Anthony Nelson and Cristofer Rosales in 2018 (Cristofer Rosales vs Charlie Edwards). His opponent, Angel Moreno, has an official boxing record of 19-2-2 (6 knockouts) and he entered as the No.41 in the same weight class. He lost to Thomas Masson in 2016 but then he has collected nine consecutive victories beating Cristian Narvaez in his last one. 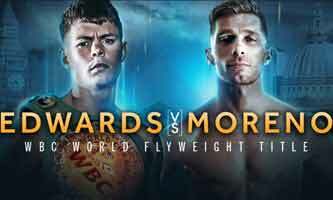 Edwards vs Moreno is valid for the WBC World flyweight title (Edwards’ first defense). Watch the video and rate this fight! Review by AllTheBestFights.com: 2019-03-30, we are going to comment and rate the fight Kudratillo Abdukakhorov vs Keita Obara as soon as possible. The undefeated Kudratillo Abdukakhorov entered this fight with a perfect boxing record of 15-0-0 (9 knockouts) and he is ranked as the No.12 welterweight in the world. In his last three fights he has beat Sherzodbek Alimjanov, Laszlo Toth (Kudratillo Abdukakhorov vs Laszlo Toth) and Twaha Kiduku. His opponent, Keita Obara, has a record of 20-3-1 (18 KOs=90%) and he entered as the No.40 in the same weight class. He fought twice last year losing to Alvin Lagumbay in April (Keita Obara vs Alvin Lagumbay) but then he took revenge on him in August. 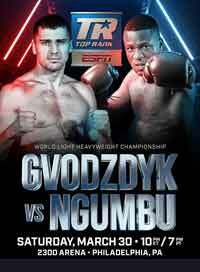 Abdukakhorov vs Obara is on the undercard of Oleksandr Gvozdyk vs Doudou Ngumbu. Watch the video and rate this fight! Review by AllTheBestFights.com: 2019-04-06, we are going to comment and rate the fight Mariusz Wach vs Martin Bakole Ilunga as soon as possible. Mariusz Wach entered this fight with a pro boxing record of 33-4-0 (17 knockouts) and he is ranked as the No.34 heavyweight in the world but he comes off two consecutive losses, against Jarrell Miller in 2017 (Jarrell Miller vs Mariusz Wach) and Artur Szpilka in 2018 (Artur Szpilka vs Mariusz Wach); before these two fights, in 2017, he had won over Erkan Teper (Erkan Teper vs Mariusz Wach). His opponent, Martin Bakole Ilunga, has a record of 11-1-0 (8 knockouts) and he entered as the No.226 in the same weight class. He fought twice last year beating DL Jones and losing to Michael Hunter. Wach vs Bakole Ilunga is valid for the vacant Republic of Poland International heavyweight title: undercard of Robert Parzeczewski vs Dmitrii Chudinov. Watch the video and rate this fight! 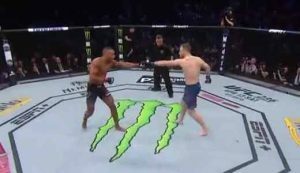 Review by AllTheBestFights.com: 2019-04-13, disappointing fight between Alan Jouban and Dwight Grant: it gets two stars. Alan Jouban entered this fight with a professional record of 16-6-0 (69% ko/tko victory rate – he has never won via submission) and he is ranked as the No.53 welterweight in the world. He lost two consecutive bouts in 2017, against Gunnar Nelson (Gunnar Nelson vs Alan Jouban) and Niko Price (Niko Price vs Alan Jouban), but he came back to win against Ben Saunders in 2018. His opponent, Dwight Grant, has a mma record of 9-2-0 (78% ko/tko victory rate – he has never won via submission) and he entered as the No.133 in the same weight class. He was defeated by Zak Ottow in 2018 but he has beat Carlo Pedersoli Jr in 2019. 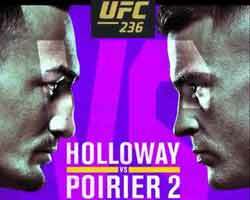 Jouban vs Grant is on the undercard of Max Holloway vs Dustin Poirier 2 – UFC 236. Watch the video and rate this fight! Review by AllTheBestFights.com: 2019-04-13, we hope to see a rematch soon: Diego De La Hoya vs Enrique Bernache gets two stars. The undefeated cousin of Oscar De La Hoya Diego De La Hoya entered this fight with a perfect boxing record of 21-0-0 (10 knockouts) and he is ranked as the No.10 super bantamweight in the world (currently the #1 in this division is Rey Vargas). In his last three bouts he has won over Alan Isaias Luques Castillo, Randy Caballero (Diego De La Hoya vs Randy Caballero) and Jose Salgado (Diego De La Hoya vs Jose Salgado). His opponent, Enrique Bernache, has an official record of 24-12-0 (12 knockouts) and he entered as the No.73 featherweight but he won just one out of his last four fights, against Emmanuel Dominguez in 2017; after this bout, in 2018, he lost to Can Xu and Emilio Sanchez. De La Hoya vs Bernache is on the undercard of Jaime Munguia vs Dennis Hogan. Watch the video and rate this fight! 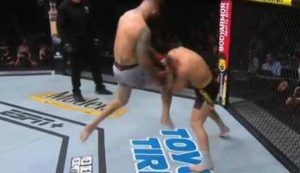 Review by AllTheBestFights.com: 2019-04-13, pretty good finish but the rest of the fight was not so exciting: Dominic Boesel vs Timy Shala 2 gets two stars. Dominic Boesel entered this fight with a boxing record of 28-1-0 (10 knockouts) and he is ranked as the No.16 light heavyweight in the world. He lost to Karo Murat in 2017 (Dominic Boesel vs Karo Murat), but then he has won four bouts beating Serhiy Demchenko (Dominic Boesel vs Serhiy Demchenko) and Enrico Koelling in 2018. His opponent, Timy Shala (who replaces Orial Kolaj), has an official record of 23-2-1 (9 knockouts) and he entered as the No.45 in the same weight class. He lost to Erik Skoglund in 2016 but then he has beat Chimwemwe Chiotcha and Gabor Detre. 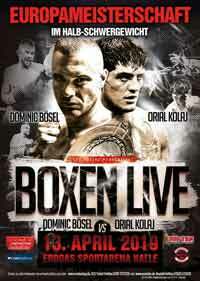 In their first bout Boesel had defeated Shala via unanimous decision (March 3, 2015 Dominic Boesel vs Timy Shala I; this second fight is valid for the EBU European light heavyweight title. Watch the video and rate this fight! Review by AllTheBestFights.com: 2019-04-13, close and tough fight between Sergiy Derevyanchenko and Jack Culcay: it gets three stars. The former Olympian Sergiy Derevyanchenko entered this fight with a professional boxing record of 12-1-0 (10 KOs=83%) and he is ranked as the No.8 middleweight in the world (currently the #1 in this division is Saul ‘Canelo’ Alvarez) but he comes off his first loss, suffered against Daniel Jacobs in October (Daniel Jacobs vs Sergiy Derevyanchenko); before this bout, in March, he had defeated Dashon Johnson. His opponent, the former Olympian and former Wba light-Mw champion Jack Culcay, has a record of 25-3-0 (13 knockouts) and he entered as the No.12 in the same weight class. He suffered two consecutive defeats in 2017, with Demetrius Andrade (via split decision, Andrade vs Culcay) and Maciej Sulecki (Maciej Sulecki vs Jack Culcay), but then he won three bouts in 2018 defeating Rafael Bejaran in his last one (Jack Culcay vs Rafael Bejaran). 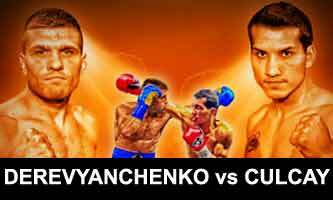 Derevyanchenko vs Culcay is on the undercard of Peter Quillin vs Caleb Truax. Watch the video and rate this fight! Review by AllTheBestFights.com: 2019-04-13, we hope to see a rematch soon: Peter Quillin vs Caleb Truax gets two stars. The former Wbo Mw champion Peter Quillin entered this fight with a record of 34-1-1 (23 knockouts) and he is ranked as the No.15 super middleweight in the world. He lost to Daniel Jacobs in 2015 (Daniel Jacobs vs Peter Quillin) but then he has beat Dashon Johnson and J’Leon Love (Peter Quillin vs J’Leon Love). His opponent, the former Ibf super-Mw champ Caleb Truax, has a boxing record of 30-4-2 (19 knockouts) and he entered as the No.14 in the same weight class. He fought twice last year losing the rematch with James DeGale (Caleb Truax vs James DeGale 2) and defeating Fabiano Soares. Quillin vs Truax is the main event of the evening. Watch the video and rate this fight!